Born the son of a sharecropper on September 6, 1941 in Parkdale, Arkansas, Danny Davis earned a BA in history from Arkansas Agricultural Mechanical and Normal College in 1961, an MS in guidance from Chicago State University in 1968, and a PhD in public administration from Union Institute in 1977. In the late 1970s, Davis served on a “Citizen’s Committee” supporting the unsuccessful congressional campaign of Timuel Black, a Chicago socialist who sat on the advisory board of the Committees of Correspondence for Democracy and Socialism (CCDS). In 1979 Davis began an 11-year stint as an alderman in the Chicago City Council. He subsequently served as a member of Chicago’s Democratic Ward Committee (1984-2000) and the Cook County (Illinois) Board of Commissioners (1990-96). After a failed 1991 bid for the office of Chicago mayor, Davis in ’92 co-chaired the Clinton/Gore presidential campaign as well as Carol Moseley Braun’s U.S. Senate run. 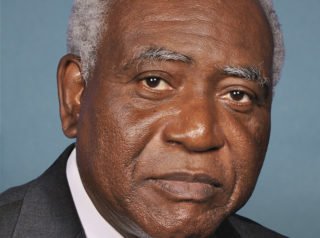 In 1996 Davis was elected to represent the 7th Congressional District of Illinois in the U.S. House of Representatives, where he since has been reelected every two years. He is a member of the Congressional Black Caucus, the Congressional Progressive Caucus, the NAACP, and the Democratic Socialists of America (DSA). In 1983 Davis served on the steering committee of Democrat Harold Washington’s mayoral campaign in Chicago. That same year, he lectured at the Chicago DSA’s Socialist School. In August 1987 in Chicago, Davis addressed and endorsed the New Agenda Conference of the Communist Party USA (CPUSA). On October 31 of that year, he co-sponsored the Illinois Democratic Alternatives conference hosted by the Chicago DSA. In May 1989 Davis delivered the opening address at the Chicago DSA’s annual Eugene Debs/Norman Thomas/Michael Harrington dinner banquet, named in honor of three prominent American socialists. That same year, Davis was the keynote speaker at the annual fundraising banquet where the CPUSA raised funds for its newspaper, the People’s Weekly World. He went on to make numerous appearances at these same banquets in subsequent years, including 1990, 1997, 1998, 2000, and 2011. In the early 1990s Davis supported Illinois state senator Alice Palmer, a socialist Democrat who was an early backer of Barack Obama‘s budding political ambitions, and who openly praised the Soviet Union during the Cold War era. On November 10, 1991, Davis served as master of ceremonies for the Bicentennial Celebration of the Chicago Committee to Defend the Bill of Rights (CCDBR), which was founded in 1960 as a CPUSA front and later became heavily influenced by the DSA and the CCDS. In 1997 Davis served on the board of directors of Citizen Action of Illinois. In 2002 Davis was a guest speaker at a convention of the pro-socialist, notoriously corrupt community organization ACORN, where he called for the enactment of a living wage, healthcare reform, a higher minimum wage, increased funding for public education, and affirmative action in employment and higher education. When the House of Representatives voted by a 345-75 margin to defund ACORN seven years later (in September 2009), Davis was one of the 75—all Democrats—who voted to continue funding the group. In 2008 Davis signed a statement circulated by the Partisan Defense Committee, an organization calling for the release of the incarcerated cop-killer and leftist icon Mumia Abu-Jamal. In December 2010, Davis, who had been seeking to represent the Democratic Party in a special Chicago mayoral election slated for February 2011, dropped out of the race in order to prevent the black vote from being split between himself and rival Democrat Carol Moseley Braun, a former U.S. Senator. Davis reasoned that by withdrawing from the race, he could increase the chances of a black person (Braun) being elected. His efforts were to no avail, however, as Rahm Emanuel—a white man—was the ultimate winner. In a February 2018 interview with the Daily Caller, Davis lauded Nation Of Islam [NOI] leader Louis Farrakhan as “an outstanding human being who commands a following of individuals who are learned and articulate, and [who] plays a big role in the lives of thousands and thousands and thousands and thousands of people.” The following month, Davis again praised Farrakhan for his “outstanding work” and said “I’ve been a fan of [former NOI leader] Elijah Muhammad,” though he noted that “I do disagree with the notion that white people are devils” — a reference to a claim made frequently by both Farrakhan and Muhammad. For an overview of Davis’s voting record on a wide range of key issues, click here. For additional information on Davis, click here. Further Reading: “Danny Davis” (Keywiki.org, Votesmart.org); “Driving While Liberal” (National Review, 12-18-2007); “New Evidence Proves Obama Was Not Honest About Membership In the Chicago Socialist Party” (Gateway Pundit, 4-7-2010); “Davis Says He Is Leaving Chicago Mayoral Race” (Newsmax.com, 12-31-2010); “Statement of Rep. Davis on Ending the Blockade of Gaza” (by Danny Davis, 9-8-2014); “Democratic Congressman Claims Anti-Semite Louis Farrakhan Is an ‘Outstanding Human Being’” (Daily Caller, 2-5–2018); “‘He Does Outstanding Things’: Danny Davis Clarifies His Position on Anti-Semite Farrakhan — Again” (Daily Caller, 3-17-2018).